> Compliance Associates > Get ahead of FDA Quality by Design requirements with purpose built Validation Automation software. Are you feeling the pressure to meet FDA guidelines on Quality by Design (QbD) principals for Process Validation? Existing manufacturing, LIMS, ERP and document management tools are lacking integration and on demand view of your processes. They have hidden costs, risks and create delays to scalable product manufacturing and revenue. 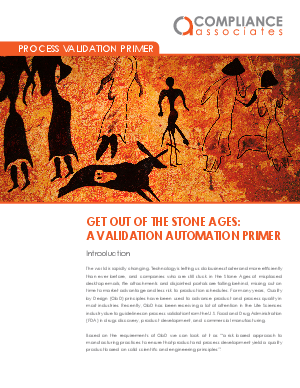 Since the FDA is demanding scientific arguments to support process and product development activies and a lifecyle approach, consider the value of a purpose built app for Process Validation. This new class of APP will bring your products to market faster and lower the risk of costly delays. Download the Primer to learn more.